A Ryanair flight carrying British holidaymakers has been forced to make an unscheduled landing due to a loss of cabin pressure, the company has said. Flight FR9336 from Bristol to Barcelona Girona airport was diverted to Limoges, central France, on Monday night. In total, 16 passengers were taken to hospital with earache. In a separate incident, a Ryanair flight from Liverpool to Sardinia was diverted on Tuesday to Stansted following a minor technical problem. Passengers on flight FR9642 from Liverpool to Alghero were transferred to a replacement aircraft. Ryanair's chief executive Michael O'Leary defended the actions of flight FR9336's crew during the incident, which have been criticised by passengers. He also denied passenger claims that the oxygen masks had not been working. Ryanair said the captain of the Spain-bound flight had descended and diverted the flight to Limoges at about 2330 local time (2230 BST) "as a safety precaution". All 168 passengers disembarked safely upon landing, it added. In total, 16 passengers complaining of earache, together with five accompanying family members, were taken to a local hospital. Arctic explorer Pen Hadow, who was on the flight with his family, told BBC News they had had no warning, "it just suddenly happened". And when he had put on his mask, there had been "no oxygen flow coming through the line". Mr Hadow, who became the first man to walk unaided to the North Pole in 2003, was also critical of a lack of communication by cabin crew and Ryanair ground staff. "It was unfortunate that, for whatever reasons, the flight crew were not able to talk to any of us," he told BBC News. "We really didn't see them during the main situation at all. They didn't say anything, they weren't visible. We have not heard a squeak. "No-one at Ryanair... there was no physical presence and absolutely no sense of any sort of frontline communication with us. "Some people thought we were going to die - that is how frightening it was. The woman sitting in the seats in front of us was whimpering. "We have been through a genuine life-threatening emergency. The runway had fire engines all the way down the line, this was a full-on situation." But Michael O'Leary said the masks had been working as they should. "Passengers sometimes misunderstand and expect there's going to be a surge of oxygen, when in actual fact there's simply a steady stream of oxygen," he said. "I've been in one of these myself. 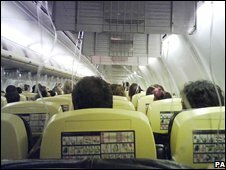 The oxygen masks were working, the correct safety procedures were followed." Passengers also complained that the flight crew failed to tell them immediately why the aircraft was descending so quickly. Mr O' Leary said passengers had not been told immediately why the aircraft was descending so quickly because safety had been the crew's priority. "We have to require that the pilots and the cabin crew deploy their oxygen masks and they can't be making PA announcements while they have their oxygen masks on," he said. "As the passengers confirmed the pilot did make an announcement once he got down to 8,000ft, when it's safe to take oxygen masks off." Ryanair said a replacement aircraft had been flown from Stansted Airport to Limoges and had taken the remaining passengers to Barcelona. The 16 passengers who had been examined in hospital - and the five who had accompanied them - would continue by coach, along with 18 others who had chosen not to fly.